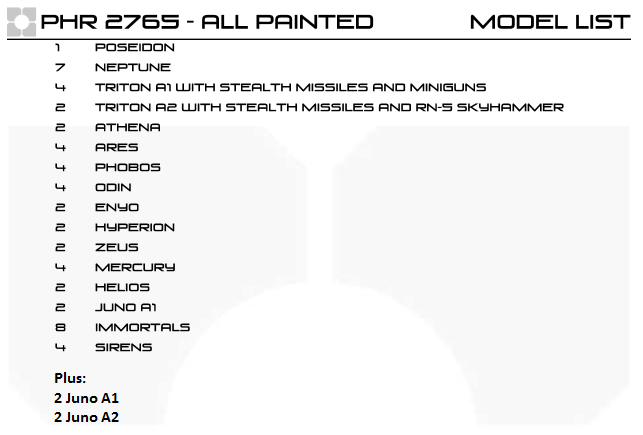 However, since this past Valhalla I have acquired quite a few additional PHR models in my collection, and I just don’t feel like painting the same scheme on the new models, especially the Type 4 walkers (Hades, Barros and Nemesis). I just don’t think that the current color scheme will look good on the bigger models, and I’m not entirely satisfied with this look. So, I have decided to re-do all of my existing PHR, as well as new PHR models, in a brand new color scheme. I spent this past Friday night and prety much all day and night Saturday working out a new color scheme, and used two of my unpainted Helios jetskimmers as test subjects. I also tried out some of the early stages on a pair of plastic June A2s. I ended up finishing one Helios completely, and (finally) to my satisfaction. Please let me know what you think of this new paint scheme! In order to re-do all of my PHR, I will be replacing my existing painted models with new ones (this process is already underway). So, I will be selling all of my painted PHR, along with a Portable Warfare “The Sargent” bag and the foam necessary to transport these models. I’m asking $450.00USD (OBO) for the entire package, bag, foam, flight stands and all, and I will ship anywhere in the continental United States for free; for international shipping, we will need to figure out what the cost would be and provide a discounted additional amount to the asking price (if any). If you or someone you know is interested in the army, please make me an offer! I'd like it to find a good home! Please let me know what you think of the new paint scheme! As always, comments and feedback are always welcome. New scheme looks great! Very detailed! I like the new scheme. I prefer the natural light shots, you get to see the actual colour (yes that IS spelt correctly). The first few photos make it look purple! Why not think about not painting everything the same? Aircraft can be different to walkers, which can be different to skimmers. You can have elements that tie the army together. That's a good point, Mike. I think they'll all have the basic components, such a the grey basecoat, red lines, metal parts and black sensor dome, but there's lots of things I could do with the walkers and the aircraft with the different shades of grey that I have at my disposal, plus other "highlight" options. aw, i liked the old blue and red scheme b/c it was so bright and different to what is normally seen. as for the new scheme, i like it for the most part. I find the yellow a bit too saturated and distracting for my tastes. The red is so foreboding, but it fights with the yellow. If the yellow were pushed closer to a cream the red wouldn't fight w/ it. Just my $0.02. I really like the grey, very military. Sorry for the tease, but I've been swamped with a class at work, and before that I took a week off to try to quit smoking. I still haven't gotten to a day without at least 3 or 4 cigarettes yet, and part of the process involves me staying the hell away from my family so that I don't snap at them and damage my relationship with my wife any more than it is (she's totally sick of my smoking, but more irked by how many times I've quit, and then started up again, so she's less than supportive of these efforts and can't resist making little digs, which just irritate my already "climbing the walls" state of being, so I'm just staying away and spending all my non-work and non-sleep time at the FLGS). gah, don't tell me that, i'm engaged!